Andrew Berry Jewellery is holding an Event Day on Saturday 2nd July 2016 from 9am to 4pm. 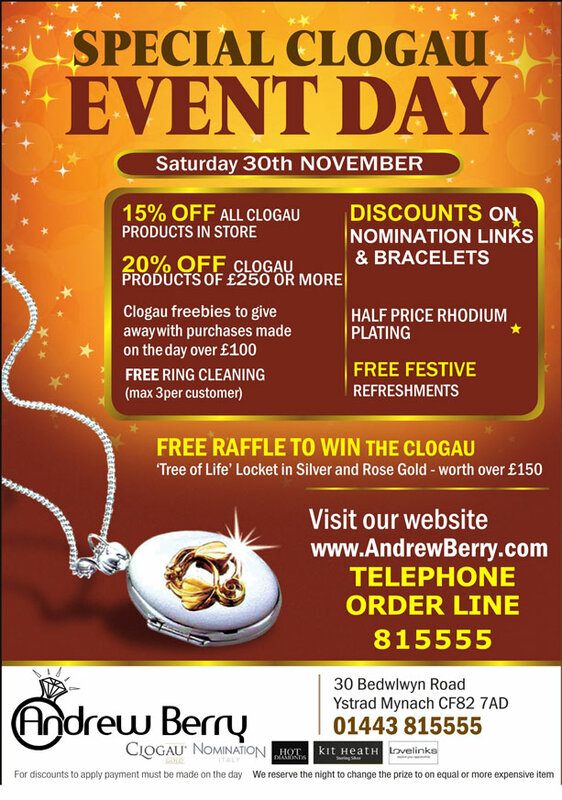 They are offering 15% off ALL Clogau products paid for in full on the day. Clogau Gold has been producing the finest jewellery, containing a touch of rare Welsh gold. 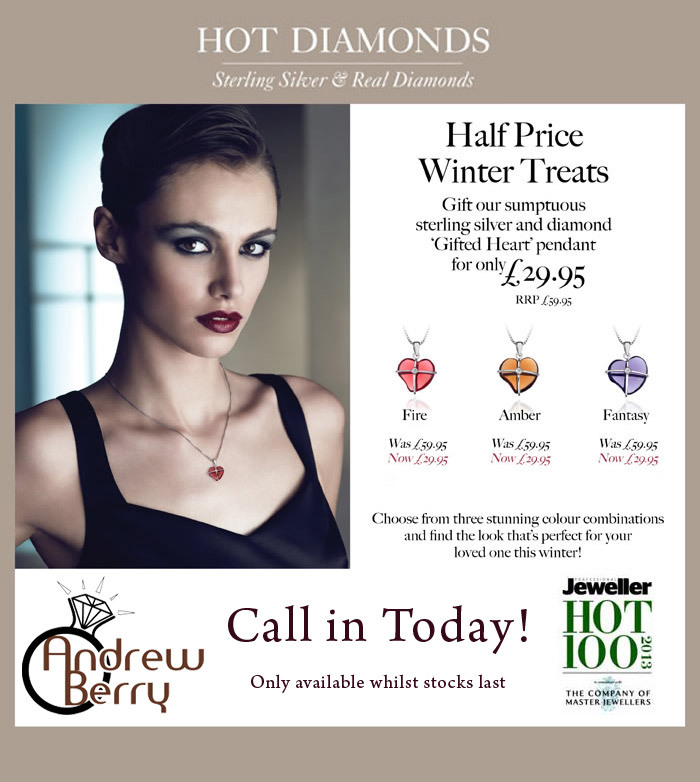 Andrew Berry Jewellery, one if the largest selections in South Wales. charm links you can have the 17 link bracelet FREE. £100 voucher to spend on Nomination too. bargains), you just can’t afford to miss it! a date in your diary now! guaranteed to have one happy lady in your house on Christmas Day! must be made by 5pm Saturday, 22nd November. ANNUAL JEWELLERY EVENT EVENING NOW EVEN BIGGER! ANNUAL JEWELLERY EVENT DAY NOW EVEN BIGGER! producing the finest jewellery, containing a touch of rare Welsh gold. 20% off. Not got a starter bracelet yet? Well can get for half price too. The offers just keep coming as Andrew is offering FREE ring cleaning, (max. 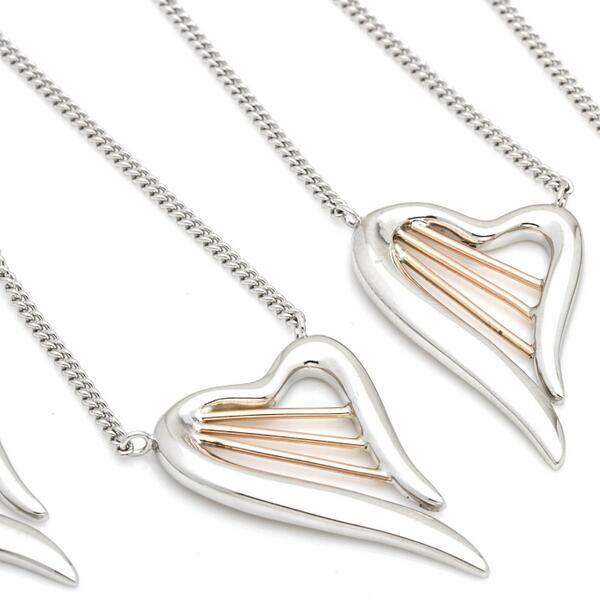 Fancy a FREE Heartstrings Clogau Pendant? For the month of May receive a free Heart Strings Clogau pendant worth £99 when you spend just £249. Telephone your Clogau order through to us and if your order is ovewr £249 we will include the Sol;ver and Gold Heartstrings Pendant FREE. All with FREE delivery too. 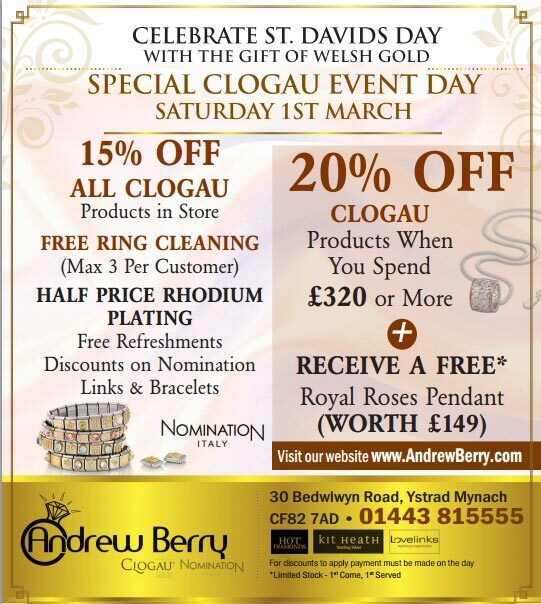 1st March, celebrate St Davids day with a gift of Clogau Gold. Andrew Berry is having an event day this Saturday 1st March, from 9am to 3pm. Throughout the day we are having light refreshments and try out our Welsh Cakes. Enjoy your refreshments while you browse our large selection of Nomination, Clogau Gold, Hot Diamonds and plenty of other brands. We are offering 15% off all Clogau gold and 20% off if you spend over £320. And 10% off all other stock. We are also giving away Clogau Royal Roses pendants to anyone who purchases Clogau Gold jewellery over £250 on the day. Would you like to know about Andrew Berry’s social media updates on Facebook, Twitter, Pinterest, Instagram and YouTube? Follow us on Twitter for the latest news and promotions or visit our YouTube channel for videos on the staff and what we get up to behind the scenes on photo shoots or the day to day running of our busy workshop. Or follow Andrew Berry on Facebook and Twitter for updates on new blog posts, prize draws and competitions or just to share your views on the latest products and trends. 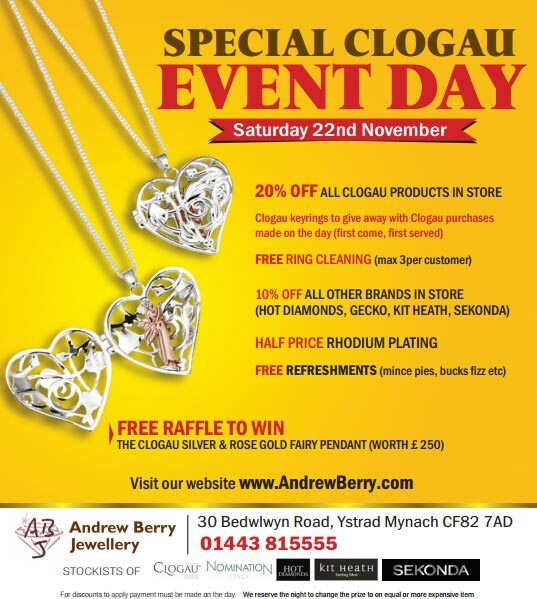 Our Clogau Event Day is this Saturday 30th November 2013. 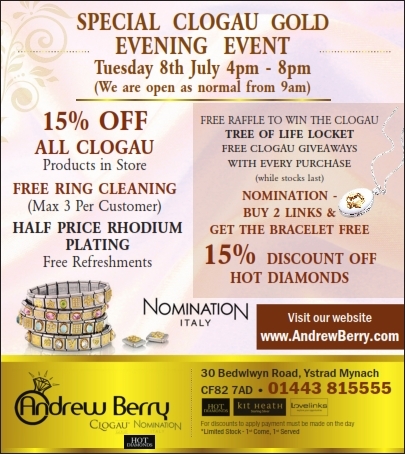 We are offering massive discounts on Clogau gold jewellery and Nomination jewellery too. Bring in your rings to us on the day for a complementary professional clean and any white gold rings that you want restored to their original bright white state, we are offering half price rhodium plating. Festive refreshments available all day. Your chance to win a Clogau silver and gold Tree of Life locket and £100 voucher for Nomination jewellery. 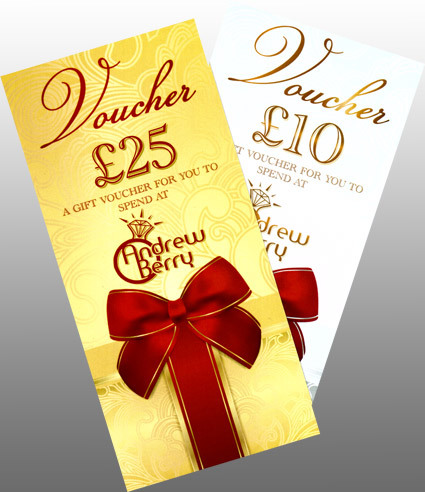 If you’re stuck for gift ideas, Andrew Berry Jewellery Gift Vouchers are the perfect choice, whatever the occasion. Now available in store from Andrew Berry Jewellery in multiples of £25 and £10. These pendants look stunning with the approaching Autumnal fashion styles. Two months ago Andrew Berry, of Andrew Berry Jewellery, Ystrad Mynach, South Wales, received an email from the editor of the national Professional Jeweller magazine saying that he had been chosen as a ‘Trailblazer’ for the ‘Hot 100’! The Hot 100 is a list of 100 names which included up-and-coming and established jewellery designers; the UK’s finest independent and multiple retailers and a number of business leaders, or ‘Trailblazers’, that collectively keep the industry charging forward. As with the Queen’s Birthday Honours List, Andrew was sworn to secrecy until all the names were officially announced at an Award Party this month at the very prestigious ‘One Marylebone’ in London.